[컴퓨터월드] 델 소프트웨어는 최근 차세대방화벽 델 소닉월(Dell SonicWALL)의 SMB용 제품인 ‘TZ시리즈’와 델 네트워킹 스위치 ‘X시리즈’와의 연동기능을 구현함으로써 보다 향상된 중·소규모 네트워크 보안 구성을 제공하고 있다. 지난해 출시된 새로운 TZ시리즈는 SMB를 타깃으로 하는 제품임에도 뛰어난 성능을 보여줌으로써 보안시장에 많은 주목을 받고 있다. 단순히 시장의 보안 기술 트렌드를 충족하는 것을 넘어 무선AP인 소닉포인트(SonicPoint)뿐만 아니라, X시리즈 스위치와의 연동을 제공함으로써 무선 네트워크 보안과 유선 네트워크의 유연한 구성 환경을 동시에 충족시키고 있다. 중·소규모 네트워크의 특징은 PC, 서버, 모바일, POS, CCTV 등 많은 네트워크 자원이 있음에도, 그 트래픽을 관리 또는 제어하기 위한 솔루션이 부족하다는 것이다. 물론 관리 인력 및 비용적인 측면에서 이러한 결과는 당연할 것이다. 많은 기업들이 IP공유기를 이용해 네트워크를 구성하고 있고, 중요 서버의 네트워크 분리를 하지 않거나, 내부 네트워크와 외부 손님을 위한 네트워크를 혼재시킨 경우도 종종 볼 수 있다. 이러한 부분은 분명 많은 보안 위협에 노출 될 수밖에 없다. 이러한 중·소규모 네트워크에 필요한 보안 요구사항에는 어떤 것들이 있는지 알아보자. 첫 번째, ‘통합적인 보안관리 솔루션’이다. 중·소규모 네트워크의 경우 많은 보안 장비를 도입하기가 쉽지 않기 때문에, 네트워크 보안 담당자들은 제한된 예산에서 가능한 최선의 솔루션을 찾고 있다. 따라서 관리 인력 및 비용 측면에서 통합적인 보안 관리 기능을 제공하는 솔루션이 필요하다. 두 번째, ‘유·무선 네트워크에 대한 포괄적인 보안 적용’이다. 현재의 기업 네트워크는 이미 많은 무선기기를 통한 업무환경을 제공하고 있고, 이에 따른 무선 네트워크에 대한 보안도 필수적인 요소로 요구되고 있다. 또한, 유선 네트워크에 대한 유연한 구성과 확장성은 관리 포인트를 줄이고, 복잡한 네트워크 구성을 피할 수 있다. 세 번째, ‘비용 대비 가장 효과적인 솔루션’이다. 적은 비용으로 가장 효과적인 네트워크 보안을 구성하는 것이 보안 담당자의 가장 큰 목표일 것이다. 때문에 이러한 요구를 충족시킬 수 있는 구성 방안이 제시돼야 한다. 이와 같은 중·소규모 네트워크를 위한 보안 요구사항에 대해 델 소닉월은 아래와 같은 제안을 하고 있다. 델 소닉월 TZ시리즈는 최적화된 멀티코어 보안 프로세서가 탑재돼 뛰어난 성능과 안정적인 트래픽 처리를 제공하는 통합 보안 관리 솔루션이다. 특허 기술인 RF-DPI(Reassembly-Free Deep Packet Inspection) 엔진 탑재로 스트리밍 상태에서 패킷을 검사해 트래픽의 지연을 최소화하고, 파일 사이즈 제한 없이 검사를 진행한다. 안티바이러스, 애플리케이션 컨트롤, 침입방지시스템(IPS), 안티스파이웨어, 콘텐트 필터 등 다양한 보안기능을 제공한다. 더불어, Dell SonicWALL의 통합 Mobile 접속 클라이언트는 Android, Mac OS, Kindle Fire 및 노트북 등 다양한 환경의 사용자들이 기업 내 자산에 안전하게 접근하도록 하여 스마트한 비즈니스 환경을 제공한다. 델 소닉월의 TZ시리즈는 무선 컨트롤러(Wireless-Controller) 기능을 제공하고 있어 전용 AP인 소닉포인트(SonicPoint)와 연동한 무선 환경을 구축할 수 있다. 또한, 소닉포인트 ACe, ACi 모델은 802.11ac 무선 표준을 지원해, 고속의 무선 환경을 구축할 수 있을 뿐만 아니라, 유선과 동일한 수준의 보안 적용이 가능하다. 방화벽을 구성할 때 네트워크를 분리하게 되면, 보통 각 영역별로 별도의 스위치가 필요하게 된다. 이러한 부분은 추가적인 비용의 증가와 이어지기도 한다. 그러나 TZ시리즈는 델 네트워킹의 X시리즈 스위치와 연동이 가능해 물리적인 인터페이스의 확장뿐만 아니라, VLAN 및 포트쉴드(PortShield)를 통한 유연한 네트워크 구성을 지원함으로써 적은 수의 스위치로도 다양한 구성을 가능하도록 한다. 또한 TZ시리즈는 PoE 기능을 지원하지 않기 때문에 PoE 기능을 지원하는 X시리즈 스위치를 이용해 무선 네트워크를 구성할 경우 효과적인 구축 및 관리를 할 수 있다. 델 소닉월 차세대방화벽은 NSS랩에서 4년 연속 추천 등급을 획득한 제품으로 훌륭한 네트워크 보안 솔루션이다. 이와 더불어 소닉포인트, X시리즈 스위치와의 연동을 통한 구성은 별도의 무선 컨트롤러가 필요 없이 무선 네트워크 보안 구성을 가능하게 하며, 적은 수의 스위치로도 유선 네트워크의 유연한 구성 및 확장성을 제공하기 때문에, 중·소규모 네트워크에 가장 이상적인 보안 솔루션이라 할 수 있다. 필요 장비의 수를 최대한 줄여 최소의 비용으로 구축 가능하다는 점 또한 매우 매력적이다. 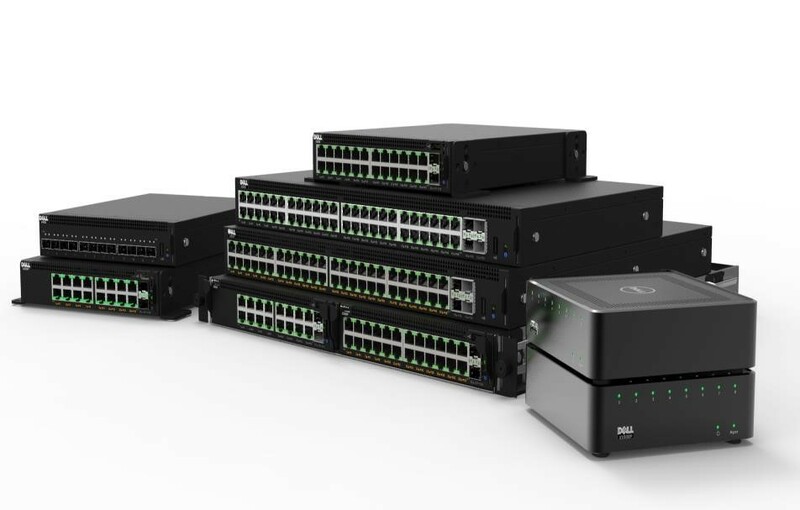 [Computerworld] As Dell Software has recently developed interoperation capabilities between ‘TZ Series’, which is the next-generation firewall product of Dell SonicWALL for SMB, and ‘X Series’, which is Dell Networking switches, and thus has offered more improved small- and medium-scale network security configuration. Although new TZ Series that launched last year is a product targeting SMB, it demonstrated an excellent performance, gaining much attention in the security market. Beyond simply meeting a security technology trend of the market, by offering the linkage between SonicPoint, a wireless AP, and an X-Series switch, it simultaneously fulfills wireless network security and a flexible configuration environment of wired networks. The feature of small- and medium-scale networks is the lack of solutions to manage or control its traffic although it has many network resources such as PCs, servers, mobile devices, POSs, and CCTVs. Of course, such a result is natural in the aspect of management staffs and cost. Whilst numerous corporations configure networks using IP routers, it is often found that they do not separate the networks of important servers, or mingle their internal networks with a network for their external guests. This obviously exposes many areas to security threats. Let us take a look at what security requirements are necessary for such small- and medium-scale networks. First, an ‘integrated security management solution’ is required. Since it is not easy for small- and medium-scale networks to procure numerous security equipment, network security staffs look for an optimized possible solution within their limited budget. Hence, in terms of management staffs and cost, a solution offering integrated security management functions is required. Second, ‘to apply encompassing security to wired and wireless networks’ is required. Nowadays, a corporation’s networks already provide work environments via a great number of wireless devices, and the security to wireless networks is also required as a necessary requirement. In addition, flexible configurations and extensibility to a wired network reduce management points and circumvent complex network configurations. Third, ‘the most cost-efficient solution’ is required. It would be a major aim for security staffs to set up the most efficient network security with the least cost. Hence, a configuration scheme that can fulfill such needs must be presented. Dell SonicWALL TZ Series is a Unified Threat Management(UTM) solution that offers high performance and stable traffic processing as optimized multi-core security processors are installed. Due to the installation of RF-DPI(Reassembly-Free Deep Packet Inspection) engine, which is its patented technology, it minimizes traffic latency by inspecting packets whilst streaming the traffic, and scans them without file size limitations. It provides a variety of security functions such as anti-virus, application control, Intrusion Prevention System (IPS), anti-spyware, and content filtering. Additionally, Mobile Connect unified client of Dell SonicWALL offers a smart business environment that allows users of various environments such as Android, Mac OS, Kindle Fire, and notebooks to securely access business assets within a corporation. As Dell SonicWALL TZ Series offers a Wireless-Controller capability, it can build a wireless environment linked to SonicPoint, its dedicated AP. Also, because SonicPoint ACe and ACi models support 802.11ac wireless standard, you can build a high-speed wireless environment and apply the security level equal to a wired network. If a network gets separated when configuring firewalls, usually separate switches are required for each domain. This leads to increase of additional costs. 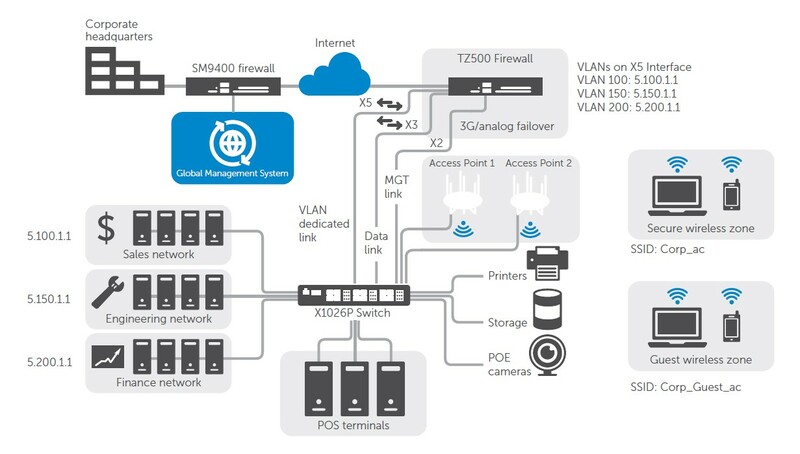 However, as it is possible to connect TZ Series to Dell Networking X-Series switches, it supports the extension of physical interfaces and flexible network configurations via VLAN and PortShield. Consequently, it enables a variety of configurations with a small number of switches. Also, since TZ Series does not support PoE function, in case of configuring a wireless network using X-Series switches, which support PoE function, effective construction and management are possible. Dell SonicWALL next-generation firewall has earned ‘Recommended’ rating from NSS Labs for 4 consecutive years, and is an excellent network security solution. In addition to this, as the configuration via linkages to SonicPoint and X-Series switches enables building of wireless network security configurations without separate wireless controllers, and offers flexible configuration and extensibility of wired networks with a small number of switches, it is the most ideal security solution for small- and medium-scale networks. It is also very attractive that a network can be built with the least cost by minimizing the number of required devices.